Today, I started researching how to make a map. Briefly read the engine 4 materials on the subject, selected a map from google earth, and created an overlay. I do have it successfully imported into the editor. My goal is to create a small town map for quick battles, and go from there into learning to create a small scenario. Guess I'm just looking for any tips from those who are vets at this task. Anyone care to share some of the tools and experience that may have helped them when they got started? Edit: Found a treasure trove of information at TFGM. Should help immensely. So maybe just some advice if amyone is up for it. The stuff at TFGM covers a lot of the resources available and where to find maps and aerial photos and stuff. Otherwise, although map making can be time consuming, it isn't overly hard to make a reasonable map with the editor overlay. It does help if you know what stuff looks like from the air but of course nowadays you do have the benefit of going into street view. A lot of people out there will say 'do the elevations first'. Personally I only start with elevations if there are large variables in elevation on a given map. If the elevation difference is less than 30m then I will generally do them at the end. Of course everyone has their own style and preferences and you'll evolve your own as you get into it. Otherwise, I might start with the part of the map that is going to be the focus of the action but generally I start with the road, river and rail layout. If there are lots of roads and little tracks, I'll generally just do the most important ones. You'll soon work out that you cannot exactly replicate the lie of roads and railways because the editor does not give you gentle curves - it is 45 degree increments all of the way. This means you will need to make some decisions about where your roads will run. You can make this easier for yourself by orienting your map overlay so that the majority of the roads run as straight as they can rather than have it strictly oriented N-S.
You will face some similar dilemmas with building placement. Each building (except sheds) occupies at least 8m x 8m and you can only orient in 45 degree increments. The buildings oriented at angles are quite big and I nearly always end up with a building at the wrong angle or too big for the building being represented. In these instances you just have to decide what looks best and move on. Unless it is a small map - don't go mad with Flavor Objects. They are resource hogs and they can also throw up some issues for AI pathfinding. When placing these objects, and pretty much everything on the map, think about why it is there and would it be there? Schoolboy errors are haystacks in fields in scenarios set during the winter, woodpiles placed right outside a doorway for someone to trip over, road signs pointing the wrong way and many more besides. Replicating the original ground as closely as possible. File size and therefore load times, because once you start adding units, AI Plans, briefings and briefing graphics to your scenario the bytes start to add up. If you haven't done so already, read the scenario editing tutorial that comes with the game - it touches on some aspects of map making and fairly predictably scenario making. Anyway, those are a few of my starters. Don't forget. This isn't school, your work's not going to be graded, and its impossible to 'break' anything. So just relax and have fun at it. Big thanks for the in depth response. I'm basing the map off the small town where I live in Concord, NC if ya want to check it out on google maps. Was looking to do something I could later turn into a small infantry MOUT map. Seems to fit the bill. So I am pretty familiar with the layout and some nuances of the land in town. The only intimidating aspects of map making that strike me hard is elevations. But as mikeyD said I'm just gonna try and have fun, take the feedback I can get and keep going at it. I dont have a lot of free time for this but I'll hope to have something to show in a few weeks and go from there. Thanks for all the tips, they are much appreciated. The biggest issue with elevations is buildings. You’ll want to try and make sure exit and entry locations will work as elevation changes can mess with that. Have you seen some of the threads criticizing specific scenarios or designers in general? Having said that I agree with @MikeyD just have fun and ignore rude people if you encounter any. The only intimidating aspects of map making that strike me hard is elevations. But as mikeyD said I'm just gonna try and have fun, take the feedback I can get and keep going at it. It would be great if you posted progress reports - like a blog - so we can see how you are getting on. I will I actually have some work done with roads and a bit of the residential area in place. Problem is I think i scaled it incorrectly. Seems a little too smooshed together. Will probably just roll with it. Get it right in the next one. I'll start a thread tomorrow and post some pictures of my progress. You may not have scaled it incorrectly - remember that everything must fit in an 8x8m tile so stuff is not always going to fit exactly to scale. If your Google Earth overlay is say 1km x 1km and your map dimensions in the editor are the same then your scale is not going to be off. Because you can only increase your CM map by increments of 8m, then of course your CM map will never exactly match your overlay dimensions unless they are also divisible by 8. I rarely worry about this and generally round the difference up rather than down in CM because you need a bit of fudge factor. 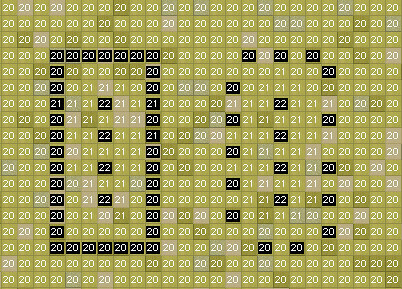 Not all of the information here is relevant to the later titles, such as the absence of the Special Editor Overlay in CMSF which required endless measuring of x and y dimensions, but it does highlight the tile and building mismatch issue. Even the best mapmakers will produce maps that are not scaled exactly to the original ground so don't beat yourself up about it. To illustrate the point, the image below is something I'm working on in CMBS (map size 3.5 x 2km and about a month's worth of work). If you look closely, you'll see that the real lake and the CM lake are not the same size and if you look at the main road just south of the lake, it is not aligned as per the original road. There is then the knock on effect for the buildings south of that road. These are the choices all mapmakers have to make themselves. The general rule though is avoid too many zig zags in your roads because they just look naff. Now I wouldn't pretend to be the greatest map maker in the World but I do take pride in my maps and try to get my maps to a state where someone can look at the real image and the CM map and think 'yeah that's the same place'. This I think is one of my better maps because I did spend a lot more time in street view than I generally do but it is not exactly to scale in those areas where I've had to move roads and buildings other features are 'smooshed together'. 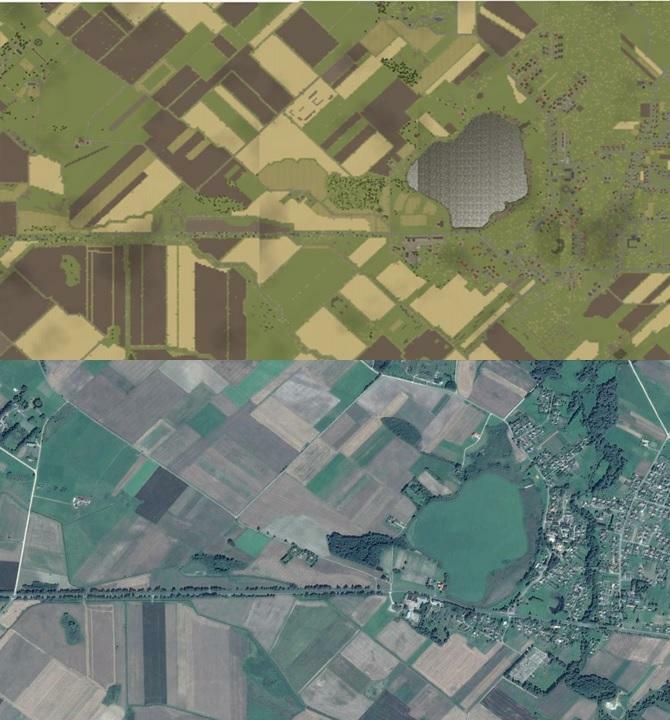 A point to note is that I haven't omitted trees on the Eastern edge of the map that are obvious in the original - they're just not showing up in CMSF because of the way the image is rendered. Here is a preview of the map with the overlay fairly visible. Did alright on the roads, do need to clean some of them up but i can do that later. There will be 2 objectives, the police Station, and the government center. I am going to take liberties with the location of the government center to get it more toward the center of the map. Between the 2 objectives are 2 main roads with many offices, restaurants, shops etc lining both. Should make for an interesting meeting point for forces between the 2 objectives. That's looking alright @homewrecker - nice to see you looking ahead to how the map will play a part in the overall mission construct. One thing to check with your 5 storey building blocks is the joins between them. The map editor will default to a solid wall so if you want to move troops between those buildings without running out of one and running into another you will need to go into the 3D view and hit CTRL left click to give them doors on both sides and make sure they line up. Be warned, this is bloody fiddly work. I did not work on a map since CMBN, but i thought it works like that-> In order to move between houses that are next to each other, you need to have 1 wall with a door and the other wall does not matter as long as you have a door on 1 wall. They did change that early in CMSF1 patch cycles so you do not need 2 doors on both sides. I think to remember the most easy way that worked for sure was to have a wall with door and simply remove the other joining wall. Nothing needs to line up, at least not the doors. It should work as soon as you have 1 door on one wall, the other wall does not matter as far as i remember. But maybe my memory it at fault here. Knocking out one wall and having a door on the abutting wall is a technique that I only use when creating T or L shaped buildings because the doors generally don't align. Otherwise I always try to put doors in both walls where I want troops to move internally through complex buildings because it just looks better. Thanks for the heads up on the interior walls, would have overlooked that. I fiddled about with editing buildings in the 3d view after work last night, had to get the engine 4 manual to find all the keys for everything, but it was 2am and time for bed. Going to work more on it later tonight, I will have more material to put together a thread on progress. Thanks, luckily this map shouldn't have that many elevation changes, some slight declines on the south and west sides of the map. There is also enough foliage and such that i don't think i need to add any low ground or covered approaches for either side. Any specific maps of yours that would be good for me to look at? Would like to see them as reference for elevations in future work. This is a sweet looking map by the way, been really into Black Sea lately. Is this for a scenario or a campaign? Thanks - and just remember I started out just like you. It was going to be mission one of a campaign but I think it will be part of a scenario pack that I will progressively upload to The Scenario Depot. ... Any specific maps of yours that would be good for me to look at? Would like to see them as reference for elevations in future work. Cause the game in 3d mode to use up more memory and result in poorer frame rate? Cause the game in 3d mode to stall more when panning the camera as the "denser" feature takes more memory to render? I enjoy making maps with steep elevation changes and am working on one now, so this is valuable information. To be honest mate I don't know. The received wisdom is that every time you click to create a direct elevation change you add processing time but I have never tested it in detail. Other factors will almost certainly revolve around the extent of the elevation changes and how big your map is. Most mapmaking involves switching in and out of 2D and 3D views to so you're bound to get a feel for load times as you go along. I suppose the best way to test is to do two test maps. One map with the left hand feature on it and the other with the right hand feature on it and check the load times. I appreciate that this is stating the obvious but it is the best answer I have right now. I can test for load times, but I don't care that much about load times. More important is how the map/scenario plays. I have suspected that elevation plays a part in how a scenario plays and will try to devise a test for actual gameplay. It is not always easy to create the map characterics with few elevation settings, but on the other hand too many of them close to each other has a tendency to create a "layered cake" effect. 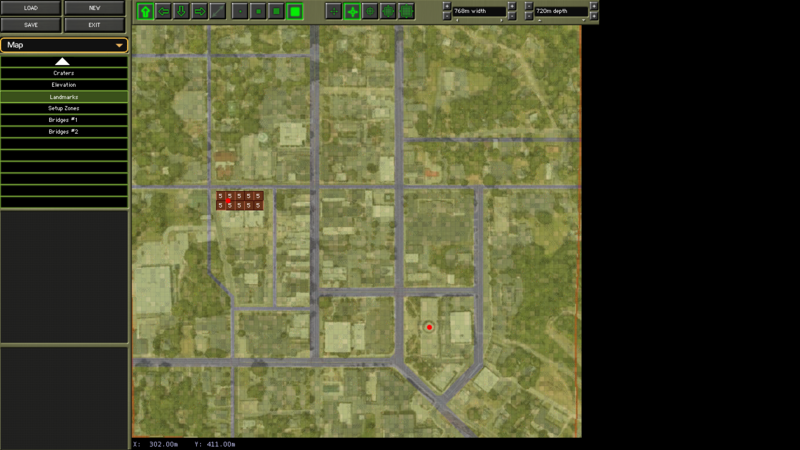 As I've added objects to the map, I haven't noticed significant increase in load times. Maybe a second or tow. Still a lot to add though. I've added the elevations I wanted for specific parts of the map. I am going to start a new thread in the CMBS mods forum with my progress on this QB map. Have made some good headway.